Nightmare Manor 2016 Review - The Scare Factor Reviews & Directory! 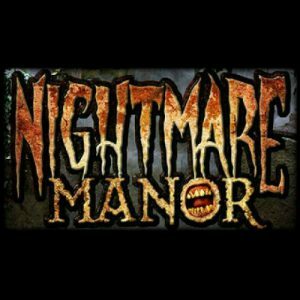 Nightmare Manor NY is a Haunted Attraction located in Rochester, NY. Team Jefferson Starship reviewed this attraction on October 8, 2016. Nightmare Manor in Rochester New York is a ¾-mile, indoor haunt with an inventive storyline and a wickedly-clever set of twists and turns. It offers haunt lovers a very safe and energetic experience while pushing their boundaries with a wide variety of scares. Nightmare Manor boasts fifteen years of terrifying patrons and building onto the frightening foundation of Dr. Jack Limon’s Manor. You’ll be delighted and petrified at the twisted creations laid out by the monsters found inside. Right out of the gate, we were impressed by the cast of Nightmare Manor. The Butler was a delightful introduction to the haunt and a wonderful character. Another standout from the typical growl and scream type of monster was the dark shape in the Crypt that was hovering over us and adding a sense of tension and terror that no special effect could’ve ever achieved. The lumberjack’s greatest nightmare deserves a round of applause for authenticity and surprise, as well as the lady doctor, who managed to go toe to toe with our wittiest reviewer. Some of the cast lacked the level of interactivity that we’d hoped for with one-note scares or a conversational loop. Some rooms were empty, but we did arrive shortly before closing. Keep an eye out for the werewolf’s towering form and don’t lose sight of the little girl that’ll be offering you up to her friends. The costuming in Nightmare Manor is truly on point. Masks are sparse and perfectly applied and the makeup and outfits are all appropriate for their scenes and effectively used. There’s nothing here that’s not authentic and eye catching. Monsters were unique and concisely constructed. We give extra commendations to the plague mask (as it’s not often used in modern haunts), the werewolf, and the gilly monster. The customer service at Nightmare Manor was excellent. We were welcomed instantly by the chilling hostess and all of the prices and options were clearly explained to us. The door greeter was cheery, chilling, and helped us with any questions we had before we plunged into the darkness. Since we came so late, we were unable to interact with the crew that was handling merchandise, but we were very pleased with the staff members that we did meet. The only people that seemed less than enthusiastic to be there were the security staff, but the large number of them was heartening to see and underlined the care that the haunt owners have for their patrons. The outside of this haunt is unable to advertise itself much due to the nature of the space. Nightmare Manor is very well marked, though, and is easy to find. The façade at the entrance of the actual haunt is intricate and quite spooky… setting the tone for the journey that is to come. There’s a definite party-like atmosphere inside, as the walkways and monsters photo op section are both lit with disco balls and laser lights. There is some noise bleed inside and outside of the haunt, but Nightmare Manor has decorated in order to ramp up their victims before bringing them inside. Nightmare Manor has a number of excellent special effects. The owners let us know that many of the rooms are designed by their more-senior monsters. The love and care in these rooms shows. The entrance room that’s run by the Butler is an uplifting experience. Extra space is created by brilliantly-designed, infinite hallways. The Crypt is bone-chilling and the grotesqueries in the stable are disturbing and believable. The victim in the Doctor’s room is also quite impressive. There were a few animatronics or effects that missed the mark: a spider with an off-putting and accidentally-hilarious sound effect, for instance; but, they were far outweighed by the other well-placed effects. Nightmare Manor has a strong thematic foundation that is introduced by the bloodcurdling Butler. It is underlined by well-placed props and subtle nods throughout the haunt as you travel the dangerous depths of Dr. Jack Limon’s world. There are some issues where one room doesn’t easily meld into the next and, instead, gives the impression of being disjointed. At one point, we traveled from a wood-lined scene to an empty, biomechanical chamber before returning to a hillbilly hollow. We imagine that this is a side effect of giving the monsters free reign over their domains and, considering how well it benefits some of the other areas, we wouldn’t suggest that their autonomy be changed. This haunt uses a variety of tactics. There isn’t a predominance of jump scares, which was greatly appreciated by our entire group. The monsters relied more on creeping terror and dialogue than screams and drop panels. The hillbillies did manage to cut off a majority of our group to give them quite a bit of threatening conversation; but, by doing so, they turned their backs on one of our members entirely. For the most part, scares were spread throughout the party and the monsters managed to weed out the weakest of each of the groups before us. One poor soul was so terrified; we watched her run past us from several rooms ahead. Nightmare Manor also has a strong finale. The ticket prices at Nightmare Manor are very reasonable. A regular ticket is $20, $30 for a fast pass, and $16 for a student with ID. Discounts are also offered to Police, Firefighters, and Military personnel. It took about twenty minutes to walk through, making Nightmare Manor about a $1 per minute attraction.